Every Monday I’ll post a new short story here, based on an image somebody out there has sent me. Welcome to the 52. This week I’m a day late because… stuff. Stuff, with things on it. But we got here in the end. I’m collaborating with Mark Wholley for your Tuesday story, a gentleman who I had the pleasure of meeting at Anthocon in New Hampshire some 18 months ago. He is the first of two Horsemen of the Apocalypse who have so far sent pictures along. I can’t look at this for too long without wanting to glance up too. You can click through for a larger version if you like. Grey morning light smogged through the small window and into the red kitchen, where it found Glyn sitting on a burgundy faux leather stool at the breakfast bar. His hands wrapped around the coffee mug in front of him, and he stared at the steam rising from the surface. The mug was too hot to clasp, but he did so anyway because the pain that pulsed through his hands made him feel connected to something. The other person in the room, sitting on the far side of the counter, wasn’t really there. The absence was not her fault, but he resented her for it anyway. He missed sitting with her each morning, sharing gossip, examining the world, even though they had never done that. Dawn had always brought with it the rush of snatched breakfasts, fast showers, and the countdown to work. There had been no time to talk. It was the possibility that he missed, the chance that something would change and such a moment of bonding would transpire. That was her role. She was the one that people told things to, and invited places. Glyn was her leech, draining away experience and news like hot blood. He bathed in her crimson reports. Now that she was dead, the world had cut him loose. That was what it felt like. He was no longer invited. A shuffle and squawk drew his attention to the window. Five pigeons were lined up on the sill, feathers puffed and heads drawn down. He frowned. They were frequent visitors, because the ledge was in the lee of the building and offered protection from the frequent driving rains. Today though, the weather was clear. He got up, crossing the kitchen to the window, and craned his neck to look at the sky. All was chrome stillness. The pigeons ignored him, even when he tapped the glass. The train into the city centre was full, but quiet. Nobody chatted. Telephones did not ring. There was not even the black and white swish of newspaper pages being turned. On an ordinary day Glyn would have been a paper swisher, but the strange stillness in the carriage forbade him his usual routine. It would make him stand out, mark him as different. Being looked at, no matter what the reason, desiccated him from the inside. Instead he stared straight ahead, trying to watch everybody else from the corner of his eye. Nobody pad any attention to him. Instead, they looked out of the window. Out, and up. As was his custom, he wore headphones in work. The pale wire trailed into his pocket, but there was no device there to plug it into. The headphones allowed him to pretend that it was his choice not to speak to anybody in the office, but he wanted always to be sure that if somebody did try to bridge the gulf he could hear them and respond. He lived in fear of such a moment, at the same time as he prayed for it every morning. The day’s data was piled next to him, a numerical sludge he didn’t understand and needed only to type into his keyboard accurately. It swallowed him for a couple of hours before he realised that there was no noise. Nobody had walked past his cubicle. Nobody was speaking on the phone or shouting over to a friend. It was silent. He took the headphones out, feeling instantly naked, and stood. On the far side of the office all was normal. Colleagues who could not remember his name sat in their little rectangles and battered their drab keyboards. With the headphones out, he could hear the little noise that drifted across the large open plan room. Nearer to him, the desks were empty. Everybody on his own team was stood by the exit, around the water cooler. Jerry was speaking quickly in a low voice, and the others were nodding as he spoke. Every now and again somebody cast a fast and anxious look at the window. They were on the fourth floor, and had a view of the office block across the road. Glyn seized his chance, and scurried across to join them. Whether it was too overt and they saw him coming, or whether the meeting came to a natural end, they turned and walked past him to their desks, leaving him stranded. Jerry nodded to him as he passed, but it was an absent gesture born of courteous instinct more than familiarity. So that he did not look foolish standing there, he grabbed a paper cup and held it under the cooler tap. There was a gurgle, but nothing came out. They had emptied it. He pretended to drink anyway, so that they would not see his discomfort and laugh. Instead of leaving the building and having his limp sandwiches in the park, Glyn made his way to the staff canteen with a red dread about his heart. Having a strategy was all very well, but he had always been more thinker than doer. The plan was simple enough though, with a low chance of either failure or embarrassment. While he might be unwelcome among any given group of colleagues, he would take his tray to a table near to the largest gathering there and listen in. They might clam up when he approached, but after a few moments he would become invisible to them again and they would start to talk. Practical invisibility was his gift. Outside the doors of the canteen, he paused and adjusted himself. Tie straight, shirt tucked in, zipper pulled up. Nothing to see here. A gentle push of the swinging doors, and he stepped through. Nobody gave him a second glance, because nobody was there. The room was empty. The company employed over four five hundred people, and none of them were hungry. Even the servers were absent. The metal trays were full of food, some still steaming, but there was nobody behind the counter. Glyn walked towards the pile of wooden trays at the end of the service area, and rested his fingertips on one while he craned his neck to scan the kitchen. It was abandoned too. Nobody jumped out to say boo. Taking a seat at one of the tables, he pulled out his phone and opened Twitter. A slide of his thumb took him to what would normally be a list of worldwide trending topics, but today there was only one. He waited. Nobody retweeted. Nobody replied. Nobody acknowledged him at all. When he returned to the office, nobody was there either. After a guilty glance around to confirm that he really was alone, he stepped into the cubicle along from his. Jenna had left her screen unlocked, and there was an email open. The subject read: ALL STAFF TAKE NOTE. The message itself was an invitation to a meeting on the second floor, immediately after lunch. The email had been sent two hours previously. Returning to his own cubicle, he unlocked his screen and checked his own email. Nothing. He had not been copied in. Although he did not have the courage to walk into a roomful of people who did not want him there, he did check the conference lounge before he left the building. The doors were closed, and when he gave the handle the gentlest of twists he found that they were locked. A murmur misted through the doors, but no matter how hard he strained he could not hear the words. So he abandoned ship. There was nobody in the elevator. Nobody was standing around in the lobby. The security guard at the main entrance was elsewhere. At least there were people on the street, scurrying with their heads down, pausing only to glance at the blank slate sky. When he arrived at the subway there was a tattered old man standing on a wooden stool beside the steps. A small group had gathered to hear him speak, but by the time Glyn was in earshot it was over. The group dispersed, and the old man made a poor show of finding something interesting to look at further down the street. Glyn strode by as though he did not care, and caught a glimpse of the single word scrawled on the brown cardboard sign the silent prophet still clasped. The train was packed with silent travellers, but the seat beside of Glyn remained empty. An elderly lady wobbled in the aisle next to it, her discomfort obvious. On a different day he would have made eye contact, perhaps even gestured for her to sit, but now he did not dare. She would refuse as politely as she could, and everybody would hear, and they would know that he knew that they knew he didn’t know. It was safer to stay silent and pretend. When he disembarked and took the stairs back to the street, rats bounded past him, along the edge of the wall, heading up. Nobody else looked surprised, so he tried to fake nonchalance too. The cemetery was a fifteen-minute walk, and he spent most of it looking at his feet. 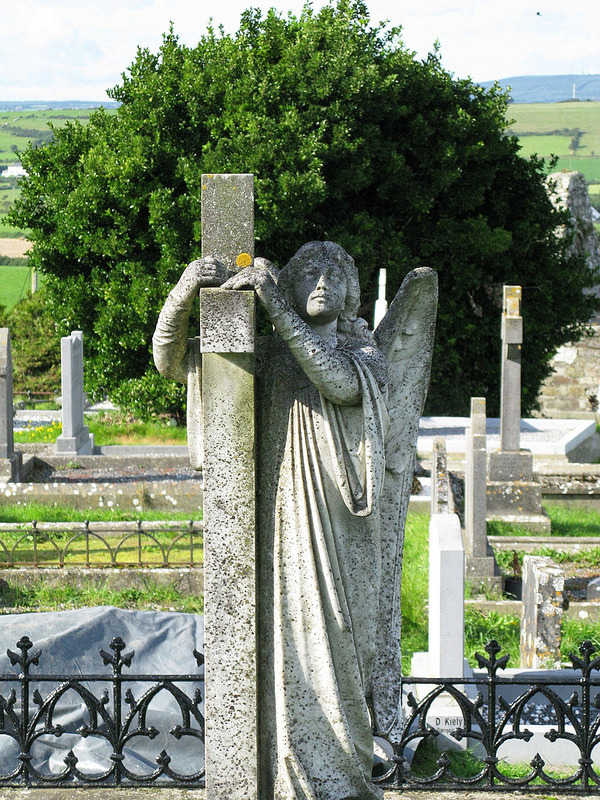 The stone angel stared at him as he approached the grave, grasping the crucifix headstone as though some powerful storm might rip it away. Glyn nodded a polite hello as always. The angel had intense eyes, and it seemed rude not to acknowledge it. He walked past, to the next grave along. This headstone was a simple white slab, with metallic lettering spelling out her name and a date eight months before. It might have been marble, the slab, but nobody had consulted him and so he could not be sure it was the genuine article. He was lucky that they had remembered to invite him to the funeral at all. Did he hate her? Or everybody else? He wasn’t sure. He knew that he was scared, and alone. Beyond the hot noise of dread, he wasn’t sure of anything at all. A mutter made him turn his head. Further along the row an older couple stood over another crooked cross. They weren’t looking at the grave, nor were they scanning the sky. Instead they were watching a copse of trees beyond the cemetery wall, speaking to one another with animated resignation. Glyn tracked across and saw what had made their hearts hang so heavily. Birds were flying out of the tree, one at a time. A pigeon flew, and then a sparrow. A starling followed, then another pigeon. That they were making so organised an exit was less startling than their direction of travel. They flew straight up, hard and fast, like feathered hailstones in reverse. Other trees were releasing their own silent, winged processions. Glyn’s heart fluttered. He turned to leave, then stopped. The angel that was always there to meet his eyes and accept his greeting had tilted back its head and was looking up. Its expression had not changed, but there was a new composure there that he had never noted before. The betrayal cut him, and he started to cry. Then he ran onto the street, dodging strangers who tutted as they watched the skies. He got home, exhausted and shaking, he locked his door behind him and closed the curtains. After a few moments respite in the chair she had once chosen for him, he unplugged his telephone, and the television, and the ancient desktop computer he had meant to replace. Then he wept and waited. When it finally descended, he met it untethered and alone. Mark Wholley is one of the Four Horsemen behind New Hampshire’s annual Anthocon convention, which celebrates speculative fiction in all its forms and distinguishes itself by being the friendliest convention on the circuit. Yes, this week’s entry is very ambiguous indeed. I need a bit of distance from it before I even know what I think about it. You can tell me how you respond in the comments, if you like – or leave me to work it out for myself. If you enjoyed the story, please do tell your friends to come and read it to. Nobody will know it exists if you don’t. This story, and the whole of The 52, is yours for free. Please enjoy it on that basis. If you want to support my writing and the publishers who’ve worked with me over the years, then consider buying a book. My latest novel is The Flesh Market, and is an excellent place to start. If short stories are your thing, why not take a look at my story ‘Skins’ in Nightscapes? Yet again another little gleaming gem to catch my eye and grip my heart-Nice one Richard!! !